From February to May I took mostly weekend trips. Things fell into place around April. I realized my lease would end in May and that I’d be attending two conferences and speaking at one in June. I also wanted to check out Austin, TX as a new place to live. So why not leave Rochester and travel for a while? I had already done the research into costs and knew it wouldn’t be much more than my current living expenses (hostels + public transport = rent + car). So I decided to get rid of nearly everything I owned, keeping only a backpack of stuff, and hit the road. Fast forward to today, almost two months later. I’ve stayed in eight cities and towns, including Sydney and Melbourne Australia. Originally I thought I’d settle into a new place in Austin at the beginning of August. After month I knew this is how I want to live. I’ve extended my plans through August to include DEFCON in Vegas and then on to San Diego. More about my future travels later. I’ve been working on projects the whole time, balancing life between work, exploring, and fun. Most of the time I’ve worked from whichever hostel I was at, with a few coffee shops thrown in. I’ve spent a few days coworking but that just hasn’t cut it. Before traveling I had been working at Coworking Rochester. I miss working next to peers and friends, helping one another and discussing important topics such as caffeinated cakes and why I love to hate Apple despite owning thousands of dollars of their products. Around this same time I decided I wanted to get a motorhome/RV to live in and travel around the US and Canada. Suddenly it hit me: cross country coworking. There must be others who feel the same as me, other freelances, consultants, and location independent workers who’d like to travel while they work. This could also be great for a small startup, allowing them to work closely together and have an experience like no other. So why not travel together, forming a mobile coworking space? The idea is simple: buy an affordable RV/motorhome, equip it with your regular coworking amenities, and hit the road. Everyone takes turns driving, slowly making our way between cities, national parks, conferences, whatever. Visit startups and investors, network, attend meetups, check out new stationary coworking spaces. My back of the napkin calculations say this can be very affordable, not much more than the cost of a hostel in a big city. Food can be made on board and bicycles can be carried for free on location transportation. If we got really ambitious we could tow a car, but maybe that’s for version 1.0. See the country and cowork for about the same cost as your current living expenses. Interested? Send me an email, dan at driver dan dot com. Leave comments and ideas below. That, my friend, is a genius idea. It’s gotta be an Airstream, though. Airstreams are sweet but I’m not looking to get a trailer, just a full RV. My dad just gave me an RV, albeit in Paris, not in the US. It’s an interesting idea. I’m not sure the space is physically large enough for more than two people to work without feeling really cramped. A community of startup RVs rolling around might work well. Combined with a link to something like BeWelcome or CouchSurfing, it could provide an interesting platform for semi-nomadic coworking. I spent 5 years on the road. Working in Bangkok for 1 year, working on the road 3 years, then travelling with no work for the last year. I found it could be difficult to work really effectively in a noisy environment. I often need peace, quiet, and space to pace to work at maximum efficiency. I can imagine if you thrive in a busy environment, then working in hostels and so on might work really well for you. I’d love to see a network of coworking hospitality exchange locations. So I can join a program, pay a monthly fee, and be able to use coworking spaces all over the world. The things I really want when I rock up are a large monitor or two, keyboard and mouse, nice desk / chair, and if necessary, a private space to talk to myself and pace around while brainstorming. Maybe a whiteboard also! Did you buy an RV in the end? I’d be interested to hear how you got on. I’m considering spending a few months working on the road from mine this summer. Still not 100% committed though, I feel like it might be an isolated environment to work in for a long period. I didn’t buy an RV. At the time it wouldn’t have been a good financial decision. I traveled through November, almost 6 months total. Working at hostels wasn’t really a problem. Most people go out and do things during the day so they tend to be quiet during business hours. The most people you could have working in an RV would depend on the size. A small one could possibly handle 4 depending on how people like working. Medium sized could handle 4 people no problem. A big one like the pic could probably accomodate 6. 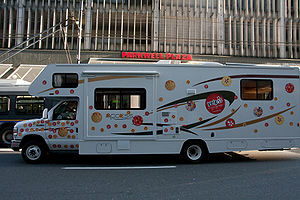 The RV I have can sleep, sit and feed six, but it’s a damn small space to cram 6 people into to work. There’s only two seating areas, so you’d be 3 people per table. I mean, physically possible, but squeezing past somebody to get to the bathroom! It’s only marginally smaller than the one pictured. High speed, low latency internet might also be a challenge. I’m half thinking of building a wifi hacker’s toolkit with directional antennas and a repeater / internal router so I can piggyback on wifi from some distance. Not sure I’ll ever get there though!